One of my least favorite things about home nail polish jobs is the stink. Also, the liquid accidents. So I was thrilled to discover La Fresh Eco-Beauty nail polish remover pads (introduced to me by my friends at Tieks, actually). These nail polish remover pads are acetone-free (the fresh Tuscan orange smells delicious), 100% biodegradable, and one pad cleans and conditions all 10 nails. 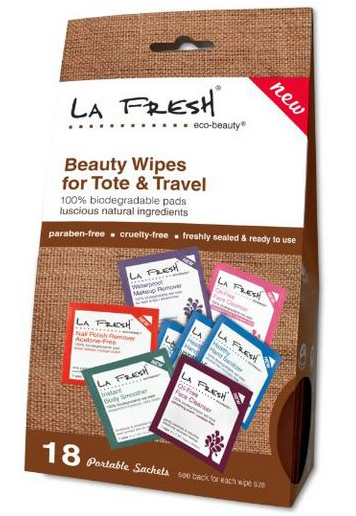 La Fresh's makeup remover and face cleanser wipes work great too and the packets are super convenient for travel.